It's true. You can plant dahlias for your garden wedding or reception site or go all out with glorious bouquets of dahlias in a formal wedding location for much less than it would cost to have a modest display of traditional florist flowers. "The real way to save is to use locally grown dahlias in their season," Colleen points out. Most people with a bit of flair can manage the flower arrangements and table decorations with dahlias, which are easy to arrange, hold up well and provide amazing color, from sweet pastels to arresting deep tones. Dahlias don't lend themselves to corsages and boutonnieres, but either you or a florist can create stunning bride's and attendants' bouquets with dahlias. "The important thing," Colleen says, "is to avoid getting totally set on a particular variety, but to choose a color range and flower size and then go with what's blooming when the wedding happens. 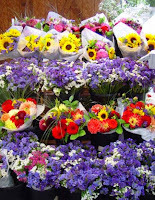 Flower farming is an inexact science, after all, and subject to the weather and other conditions." Don't scroll through dahlia sites and decide on a specific variety, she advises. 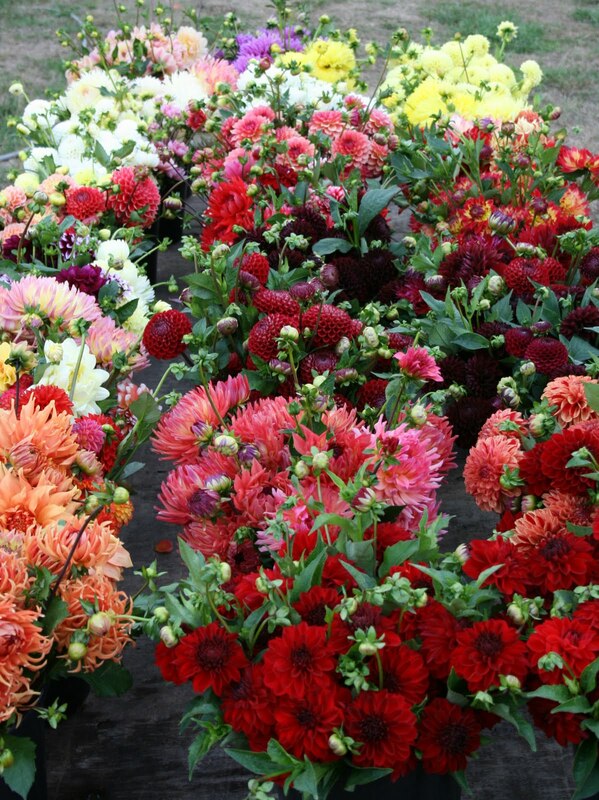 Instead, go to the dahlia farm, choose colors and forms you like, and arrange for the quantity you need. If the specific variety you saw in flower when you visited has finished blooming, another that's similar will be available to take its place. "And farmers' markets are great sources," Colleen adds. Most markets of any size have dahlia growers with bouquets of dahlias for sale, and you can talk to the vendors and find out what's likely to be in bloom when the wedding happens. 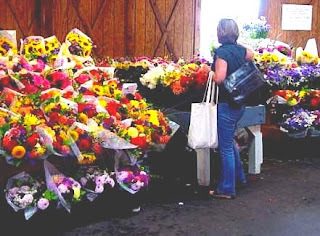 You can walk into the market and acquire luscious bouquets that go straight from the wrapper to a vase for the church or other wedding site. 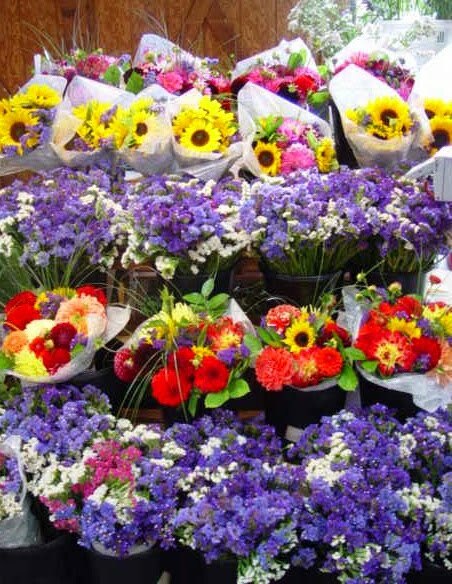 If you're a do-it-yourself person, you can create your personal flowers and floral arrangements at amazing savings. At Lynch Creek Farm, owner Andy Hunter estimates a $1 per stem figure for large sales — dahlias by the bucket. If you, or someone you know, grows dahlias, you've got it made. If not, no matter where you live, you're likely close to a good dahlia source. Check the American Dahlia Society website for a directory of growers in your state or region and arrange for dahlias from a farm near you, and you'll have the pleasure of knowing your wedding flowers weren't shipped from some other hemisphere. The color and impact of beautiful dahlias can extend to the surroundings for your wedding. Now's the time to acquire and plant dahlia tubers for your wedding this summer or fall. If you plant dahlia bulbs in large pots, you can move them to the wedding or reception site to create the ideal entry to your wedding event. If you'll be entertaining guests at home, treat your garden to an infusion of dahlias in the colors and forms of your choice. In either case, you will have dahlia plants for the rest of the season. Best of all, when you restart them in future springs, you'll have not only gorgeous anniversary flowers but lovely memories as well.